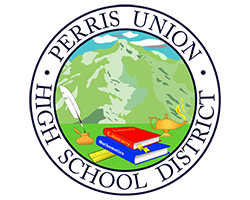 The Perris Union High School District (PUHSD) continues to be a state model for providing full inclusion, full access, and full opportunity for students enrolled in special education. All students in PUHSD deserve the best and we provide the best. Nationwide, we see a call for equal opportunity for all people in all walks of society. Schools are no exception to this call. In past decades, students with disabilities were often sent to “special schools” in America. If allowed to remain on campus, special ed students were often relegated to isolated portable classrooms on the edge of campuses which segregated them from the daily activities of regular ed students. Oftentimes, these students were not allowed to participate in the same courses as regular education students, much less enroll in classes that prepared them for college. This is not the American way and it is not the PUHSD way. At PUHSD, we ensure that all students have the opportunity to not only earn a high school diploma, but also graduate A-G eligible and are ready to apply for college if they choose. For those students choosing the career world, our rigorous school-to-career curriculum prepares them to compete for jobs in our society. At PUHSD, all special ed students are challenged to take regular ed classes alongside regular ed students. Our special ed students are not held back and excluded. Instead, they are pushed forward and included. For students seeking to earn a diploma, students participate in six periods of regular academic and elective courses designed to prepare them for college and the career world. Students are encouraged to take A-G college prep courses alongside their general education classmates. Depending on their disability, their core academic classes are taught by a general education teacher alone or a general education teacher with support from a special education teacher or a paraeducator. All educators in the classroom work collaboratively, meeting the needs of all students, not simply those in special education. This additional support allows special ed students to be successful in the general education environment. With this “push-in, full-inclusion” model of instructional delivery, special ed students are exposed to rigorously challenging curriculum. During seventh period, special ed students take a study skills class called Student Organization and Resource (SOAR). This class is designed to help special ed students stay organized and prepared for all of their classes. The course is taught by the student’s special education case manager which gives them daily access to this vital person everyday. Special education students who will not earn a high school diploma, but function in high enough cognitive levels to live independently in society, are enrolled in as many core academic and elective courses as possible. These students are often referred to as “Special Day Class” students. They have a case manager who has a classroom that serves as their “home base.” However, these students are mainstreamed into as many general education courses as they can manage during the school day. Typically, these students begin by enrolling in physical education, Naval Junior Reserve Officer Training Corps (NJROTC), art, and music courses. Initially, the content may be intimidating for some of the students, but as the semester progresses, they learn to adjust and handle the content. In addition, they learn that they can take classes alongside general education students and learn that they don’t have to remain in the same classroom throughout the entire school day. In some cases, these students will take a core Math or English course with their case manager. Consistent with our PUHSD philosophy, when mainstreamed into regular classes, these students are included in challenging activities along with other college prep and diploma-bound students. In most cases their grades are modified, however, they are still exposed to the same high-level instruction as those students who are preparing for college. As a result of this “full access and full-inclusion” philosophy, we often see students who had not planned to earn high school diplomas be successful in earning a diploma. Students who don’t earn diplomas end up transferring to one of three local “18-22 Year-Old Life Skills Transition” programs. By exposing these students to rigorous courses in our high schools, our students often thrive in the local “18-22 Year-Old Life Skills Transition” programs. Students who are enrolled in our severely handicapped program also experience the full access and full-inclusion atmosphere. Severely handicapped students are assigned to a severely handicapped teacher and classroom. This classroom serves as their “home base” during the day. In this facility they can attend class, eat lunch, and socialize with others. However, they are not required to complete those activities in this room all day. In fact, our severely handicapped students are encouraged to leave the room with supervision and eat lunch in the quad with the general education students. They are also encouraged to visit the library and student store and socialize with as many students and staff as possible. By encouraging our severely handicapped students to be out on campus, they are learning to interact with others. Just as equally important, our general education students and staff members are learning to interact with our severely handicapped students. Our full access and full-inclusion model prepares everyone on our campuses for living and interacting together in society. In terms of campus activities and extracurricular activities, our special education students are invited and encouraged to attend athletic events, take roles in plays, participate in pep rallies, and participate in community service activities. 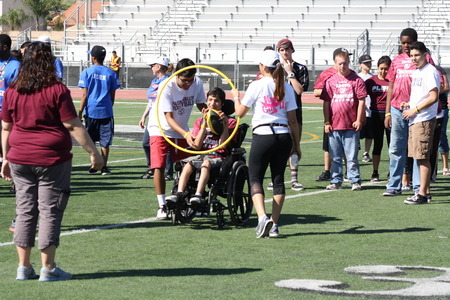 Oftentimes, special needs students are some of the most excited fans at our athletic events. 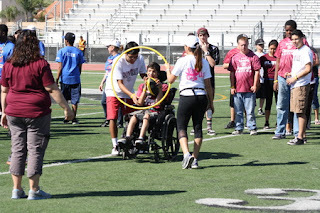 Each year, the PUHSD holds the “Sports Challenge,” a Saturday field event where our severely handicapped students have the opportunity to participate in different athletic events. These events are hosted by athletes from different athletic teams in our schools. The event is well attended by students and spectators and serves as another example of our district’s effort to include all students in school activities. PUHSD hosts a districtwide prom specifically for our special needs students. Students dress-up, eat together, socialize, and of course, dance together. It’s an exciting event where our students feel safe and supported. In addition, our special needs students are also encouraged to attend the regular prom at their home school. In most cases, the special needs students attend as groups and are escorted by their teachers and paraeducators. These proms are merely one more way to provide full access and full opportunity for our special needs students. The Perris Union High School District values the education and experience of all students. Students enrolled in special education are constantly challenged, encouraged, and provided full access and full inclusion to the same opportunities as general education students. For this reason, PUHSD continues to stand as a model of equal opportunity and equal success for all of our students. We encourage our community to provide ideas as to how we can continue including our special education students in activities in our local schools and communities.